When I'm working at my bench, a giant birch tree is my constant companion. 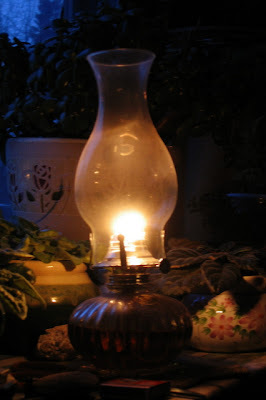 All I have to do is look out the window, and there it stands, a gorgeous guardian spirit. 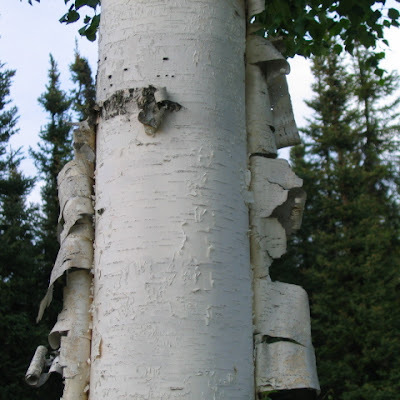 Most of our property is covered in black spruce, so the bright white bark of this birchtree stands out. When I'm daydreaming or trying to figure something out, my eyes rest there. 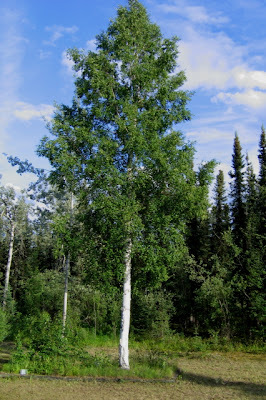 Here's my companion birch in early summertime. 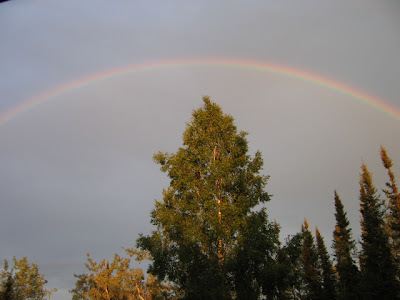 Decked with a rainbow in the golden light of a late summer rainstorm. And here is a close-up of her bark. 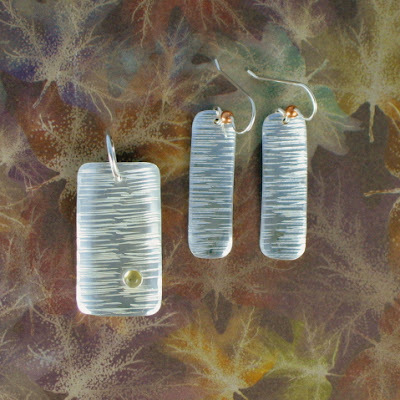 No wonder, then, that one of my favorite jewelry patterns is called "Birches." Inspired by my faithful birch tree, it's also a lot of fun to make, as I enjoy hammering the bark pattern. Here I've added a tiny, pale citrine to the pendant. It reminds me of birch syrup, which I keep promising myself I will learn to make. 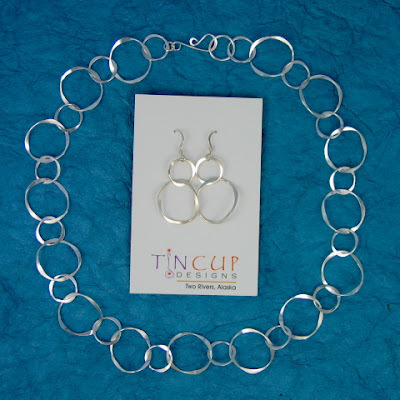 These earrings and pendant are polished to a high shine; unfortunately, the shiny part shows up as grey in my photos. But I can promise that you will stand out as brightly as my birchtree when you're wearing them. Serendipity is one of my favorite words, and it's a concept I embrace wholeheartedly: That so often when we're looking for something, we accidentally find something else that's even better. So I should not have been surprised to find an email waiting for me after my last blog post asking if anyone would be interested in bartering a bit of web design for jewelry. But here's the fun part: The person who emailed me is substitute teaching in Fairbanks. She had picked up a copy of an Ikea catalog at the school (on her first day working there), and my business card fell out. She liked the design, was surprised that I'm in the Fairbanks area, and so she looked me up on the Internet. Ta daaa: There I was, asking for help with something she loves to do. So we've talked, and it sounds like we've got a deal. Don't you just love it when the Universe gives you exactly what you need? And makes you laugh and shake your head at the same time? It's March. We've still got two or three feet of snow on the ground, depending where you step. It is warmer: Yesterday it was about 27 degrees F. We're gaining nearly seven minutes of daylight every day, and our days are already nearly 12 hours long. But I'm impatient. Yes, I could be out there on my snowshoes, enjoying the clean sharp air and looking for animal tracks and birds. I do love the way snow makes various things — say, a stack of summer tires or a clump of small spruce trees — look like cupcakes with icing or sugared donuts. But dang it, I'm ready for some color! I want leaves and flowers and butterflies! When I'm working on one of the Forest Floor pieces, I'm not just shaping metal. I'm enjoying summertime in Alaska. Did you know that scent is considered the strongest trigger for memory? The scent of the leaves, stored in layers of blotting paper, is fresh and earthy — and when crushed in the rolling mill, the leaves' sap and oils perfume the studio. Instantly, I'm back in the woods, kneeling on thick moss, watching the sun shine through the canopy of birch leaves, picking berries. Here are just a few of the plants I use in my jewelry. All of them live on our 10 acres in Two Rivers. 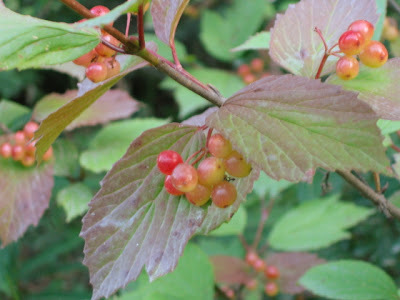 This is High-Bush Cranberry, good for jelly. 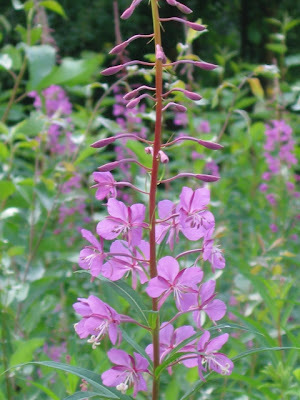 Here is Fireweed, the barometer of our summertime. As the blooms progress up the stalk and finally burst into puffy white seed fluff, we know summer is going and it's time to batten down for winter again. 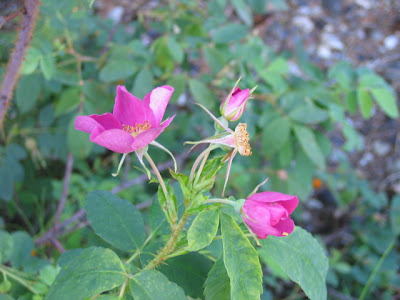 And here are our lovely Alaskan Wild Roses. They seem to bloom all at once, and only for a few days. They're everywhere; the air is sweet with them. And after the roses come the brilliant red and orange rosehips. 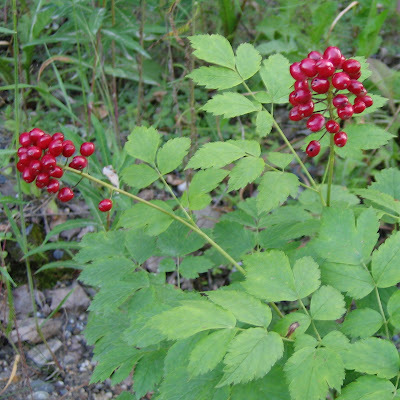 You'll find these and many others in the Forest Floor pieces. 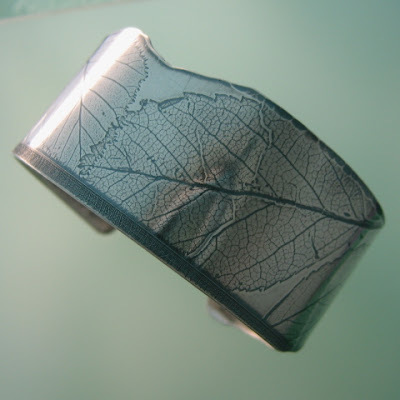 Just as in nature, no two cuffs or pendants or pairs of earrings will ever be the same because the leaves are crushed and destroyed in the embossing process. After the metal is embossed, I saw the edges a bit and file them. 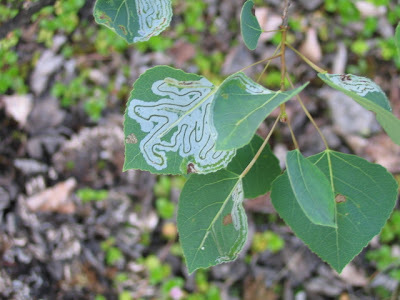 I like to make the pattern irregular, like the bug-bitten edges of some plants and trees. The leaves always shift a bit while going through the mill, so I'm never sure what I'll see until it's done. There's always a "flaw," where the metal slipped too much and the pattern didn't take or where the leaves cracked or moved too far apart. This actually delights me. These are opportunities to play, serendipity instead of mistake. In the cuff you see here, a slight diagonal space along the bottom edge didn't take the leaf pattern at all. Wonderful! It gave me an opportunitiy to hand engrave cross-hatching there. The straight lines contrast nicely with the irregularities of the natural forms, don't you think? 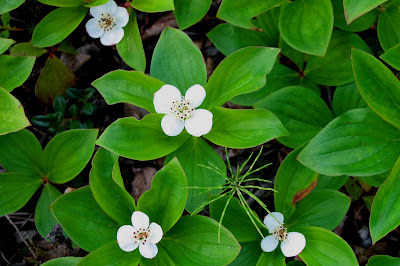 Now you know that each Forest Floor piece carries with it the reality of nature in Alaska, the memory of specific summer days and specific places, and a little bit of serendipity. What a wonderful mix!